As hotly-tipped Stockport quintet Blossoms announce the release of a new EP, Getintothis’ Jake Marley casts an appreciative eye over their newly released video to see what to expect. Recorded at Liverpool’s Parr Street Studios with The Coral’s James Skelly and producer Rich Turvey, Blossoms‘ new EP, released on February 19, features four new tracks with title track At Most A Kiss available as an instant download for all pre-orders. At Most A Kiss is the latest in a line of EPs the band have released while working with Virgin EMI and follows on from the well received Blown Rose and Charlemagne. Early indications suggests this to be the final stepping stone en route to the longed-for debut album their growing fanbase craves and if that’s to be the case, glam rock and 00s synth has found a new lease of life amongst these leather jackets. The slick monochrome video released alongside the announcement hints at further progression and backs-up the band’s frequent comment that there’s much more to their sound than reverb and guitars, detailing an equal love for the synth majesty of Abba as well as the thrashing guitars or folk-psych of their Coral masters. 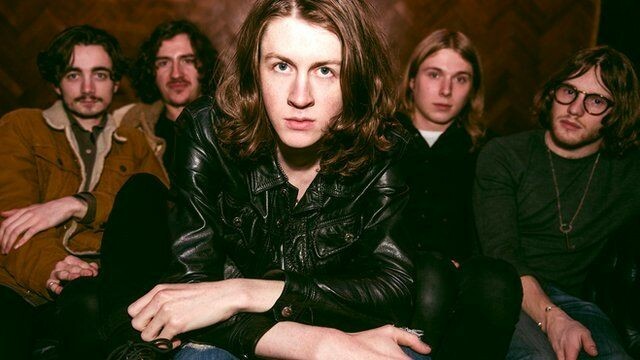 Blossoms head out on tour this spring with dates penciled in alongside The Libertines before touring the length and breadth of the country, culminating in a highly anticipated date at Liverpool’s 02 Academy on March 25, ably supported by Scouse big-hit psychers The Vryll Society.